Older versions of Mac OS X may store the data here: ~/Library/Application Support/iTunes/ in some variation of of iPod or iPhone firmware. With Windows 10 and Windows 8, look for the appropriate Software Update folder within that directory. You can look around in that iTunes directory if you have multiple iOS devices. Where can I download IPSW files? 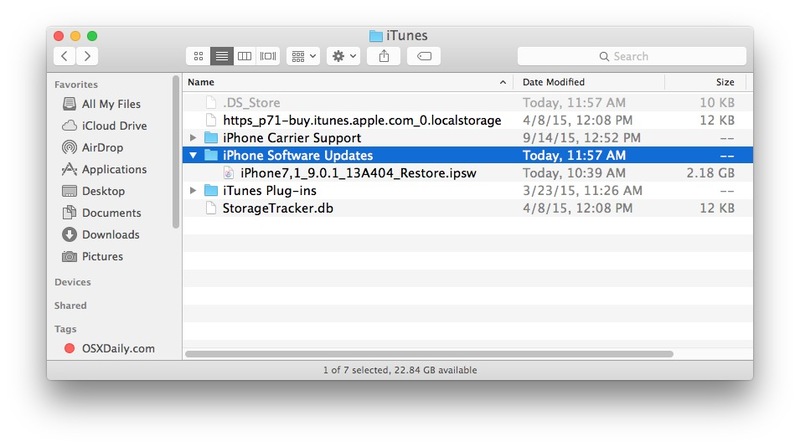 You’ll find links to each available iOS version as an IPSW file. These are all official versions of iOS firmware hosted by Apple on Apple servers. You’ll want this if a download corrupts or gets interrupted, you will need to clear it out before reinitiating the attempt from iTunes. Download direct works too. Mac: just don’t keep other IPSW files there as a storage place because SnowLeo will put them in the TRASH without letting you know. Hi i found mine in my trash on windows 7 if your jailbreaking with redsnow and you dont have your current ipsw file for you ipod go download it. atv ipsw are inside ~/Library/iTunes/Apple TV Software Updates/ folder.. The easiest way to find the ipsw mac location is by going to make sure you have selected Finder in your dock (usually the icon on the far left of the dock) hold down the ALT key and select Go from the Menu and then select Library. You’ll notice that if you don’t hold down the Alt key, you won’t see the Library option.